The Purple and WhiteWhy Do Football Games Start at 1:00? Why Do Football Games Start at 1:00? When Millsaps fans and students gathered at Harper-Davis field on Saturday, Sept. 16 to watch the Majors take on Trinity College, they noticed how warm the weather was at kickoff. The temperature at the time of the game was almost 90 degrees. A week later when Millsaps faced off against Sewanee, it was more of the same with the temperature once again reaching over 90 degrees. With high humidity, hot turf, and full pads, it was probably even warmer for players on the field. Like all of Millsaps’ home games this season, both of those games started in the early afternoon. According to Millsaps Athletic Director Donnie Brooks, this is because the Southern Athletic Association, the conference Millsaps is a part of, sets all conference games to start at 1 p.m. The exception to this rule is the Homecoming game, which is the only conference game where the school is allowed to decide on the start time. This year, Millsaps’ Homecoming game against Centre College on Oct. 28 begins at 2 p.m., an hour later than any other home start time. Brooks noted that the school is allowed to set the date and time for all non-conference games. 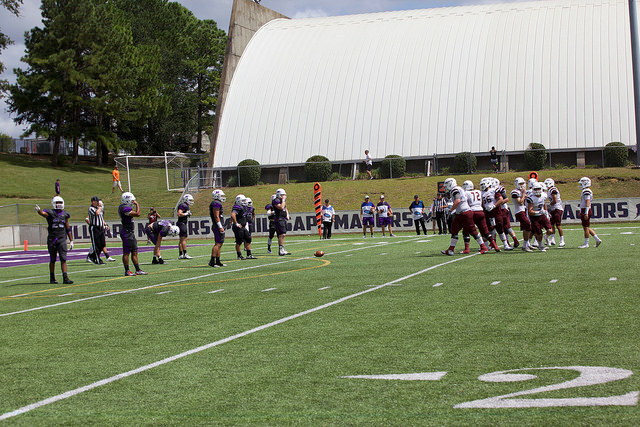 This season, Millsaps played two non-conference games against Texas-Wesleyan University and Belhaven University. The Belhaven game, which is the only night game on Millsaps’ schedule this season, took place on a Thursday night and has been a night game for each of the last three seasons. When Belhaven visited Millsaps on a Thursday night in 2016, it drew a crowd of 3,987. The Belhaven night game was the best attended football game last season, and none of the home games from the 2016 season that started at 1 p.m. got more than 2,333 attendees. In 2015, the Belhaven game which started in the evening had a crowd of 3,500 people. None of the day games drew a crowd larger than 1,843. While those numbers may be skewed since Millsaps-Belhaven is a rivalry game and draws fans from both schools, in both years it still had higher attendance numbers than other high profile games that draw large crowds, such as Homecoming and Parents Weekend. For the players, playing during the day in hot weather can present its own set of challenges. Players specified the importance of staying hydrated and eating right in order to prepare for games that start early in the afternoon. Jarreau said that the coaching staff has put an increased emphasis on staying hydrated during the week, and they had a nutritionist speak to the team during fall camp to talk about staying hydrated and eating the right foods. Stockerl said that during the game the team provides salt packets as well as Gatorade and water on the sidelines so players can get water and electrolytes during the game. Despite the challenges that can occur when playing a day game in warm weather, Stockerl doesn’t believe that it makes a difference what time of day the game is played.